With a dire shortage of visiting locomotives,beyond the Railways control,one could be forgiven in assuming that the Gala would lack interest,but with all the problems encountered i think it turned out allright,plus the weekends weather was exceptional considering the dire weather we have been having lately,so an enjoyable day. 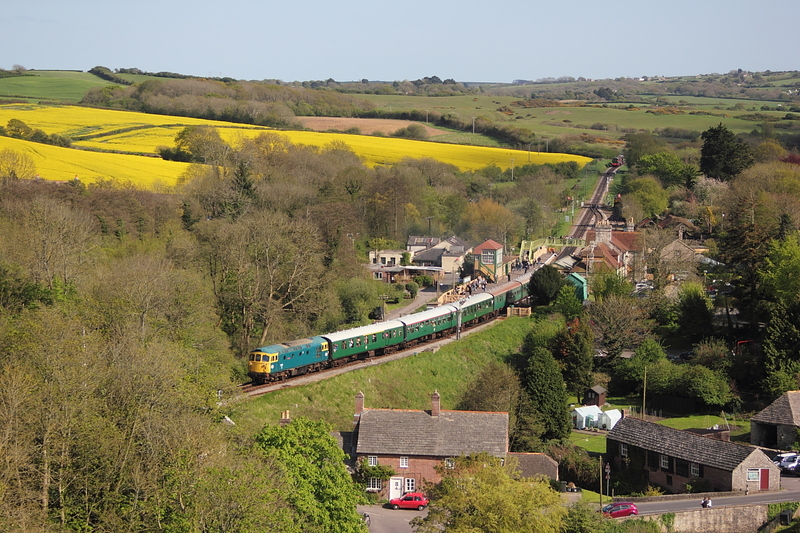 You may be questioning ,why is a steam train running on a supposedley Diesel Gala,due to circumstances beyond Swanage Railways control,a convoy of visiting locos incl a Deltic,Warship and a pair of Twenties failed to arrive due to a failure of a class 47 hauling them in the Gloucester area,the surprise was that a Class 50 was sent to return the lot back to the SVR,causing somewhat of a locomotive shortage at the Gala,hence 4MT 80104 passes Corfe Common on 2S01 being the first train off Norden for the day,at 09.15 heading for Swanage,a tad late. NB the rapidley applied D on the number,glad to see a sence of humour. Blimey the comedians are out in force,With a a Shambles headboard,one of the star attractions was Network Rails 57312 from Eastleigh with ED 73136"Perseverance" in tow for braking purposes(itself quickley gained the day before to help offset the locomotive shortage,which it did all day),seen here passing Corfe Common on the first passenger up working of the day, ie 1N01 ,the 09.35 Swanage to Norden service. 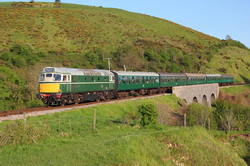 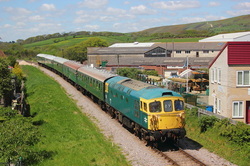 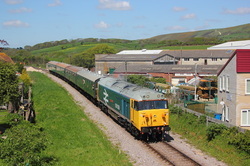 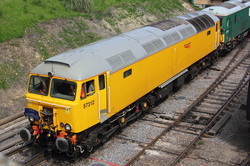 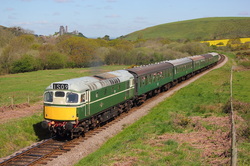 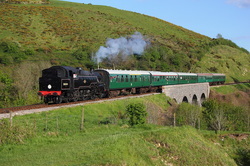 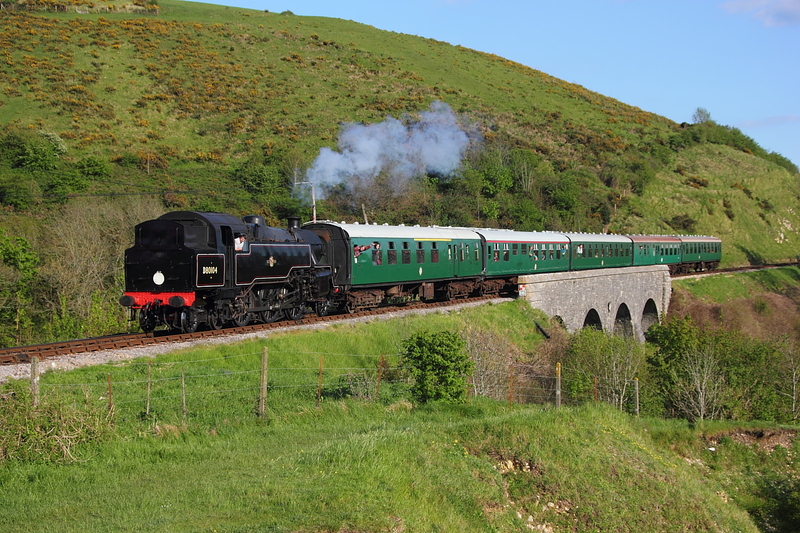 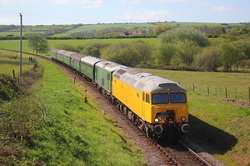 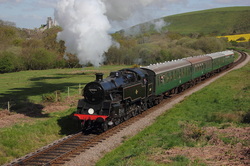 33111 "Hot Dog" powers 1S01,09.35 Norden to Swanage through Corfe Common. 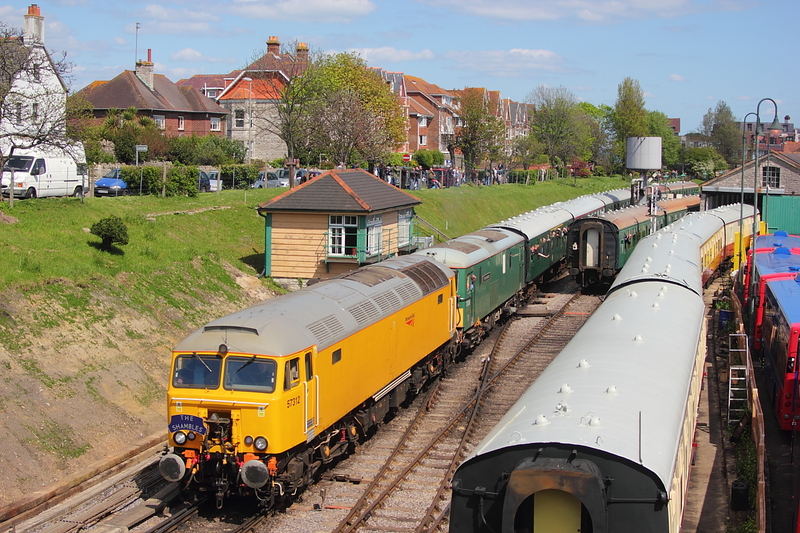 50026"Indomitable" approaches the coastal town of Swanage with 1S03,the 11.05 from Norden to Swanage. 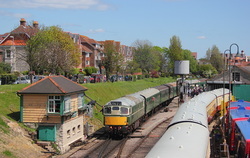 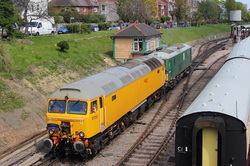 33111 approaches its destination at Swanage with 2S09,the 12.15 from Norden. 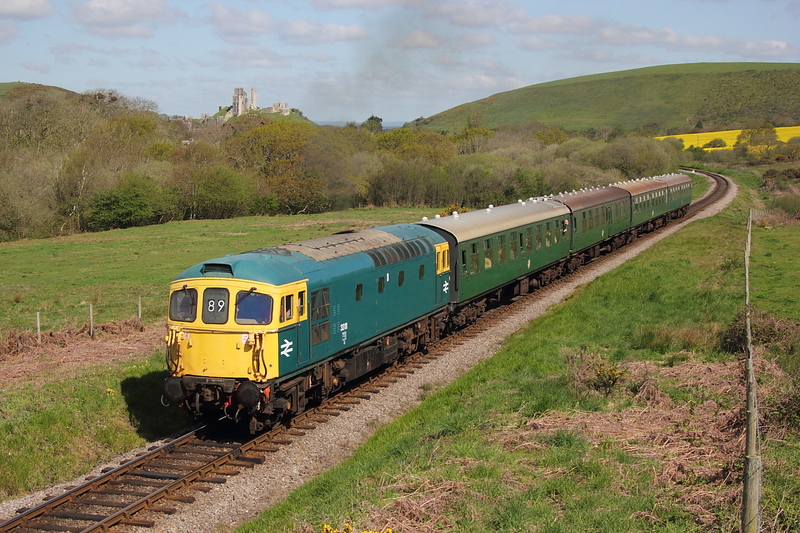 57312+73136"Perseverance" round the curve on the approach to Swanage town in the dying rays of sunshine working 2S11,the 1300 Norden to Swanage service. 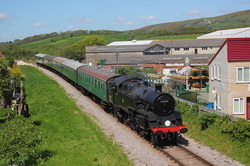 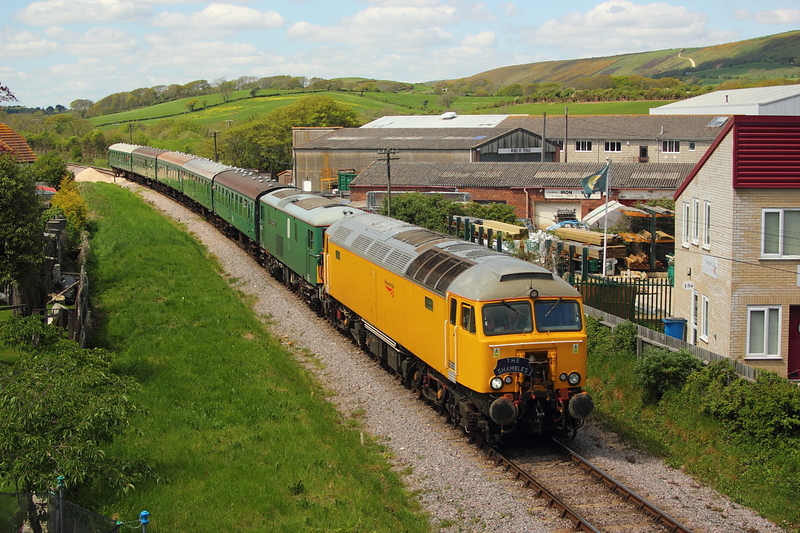 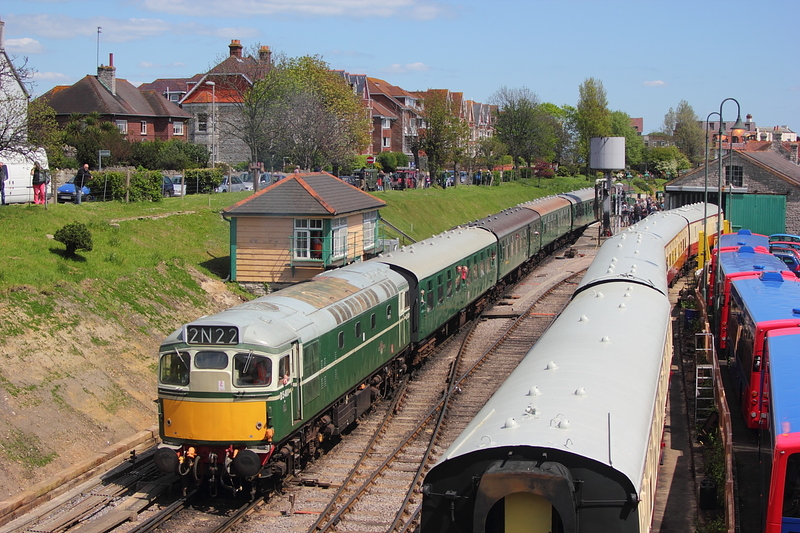 D5401 picks up the token from the box as it departs Swanage station at 13.45 on 2N14,heading for Norden. 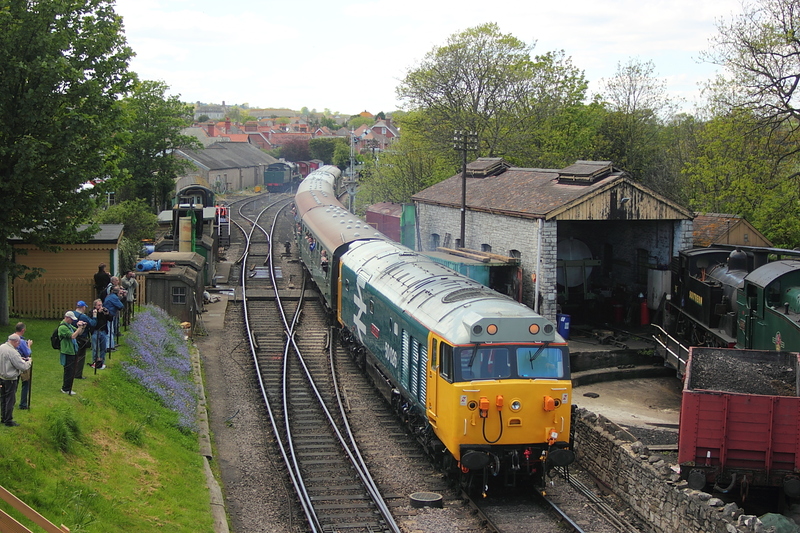 50026"Indomitable" arrives at Swanage under a massive floater on 2S13,the 13.45 service from Norden. 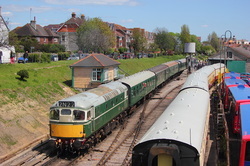 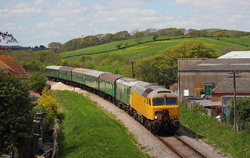 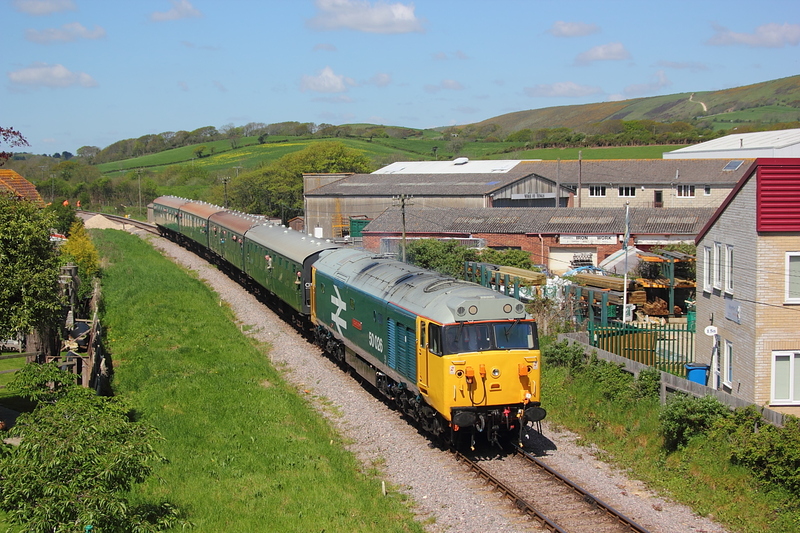 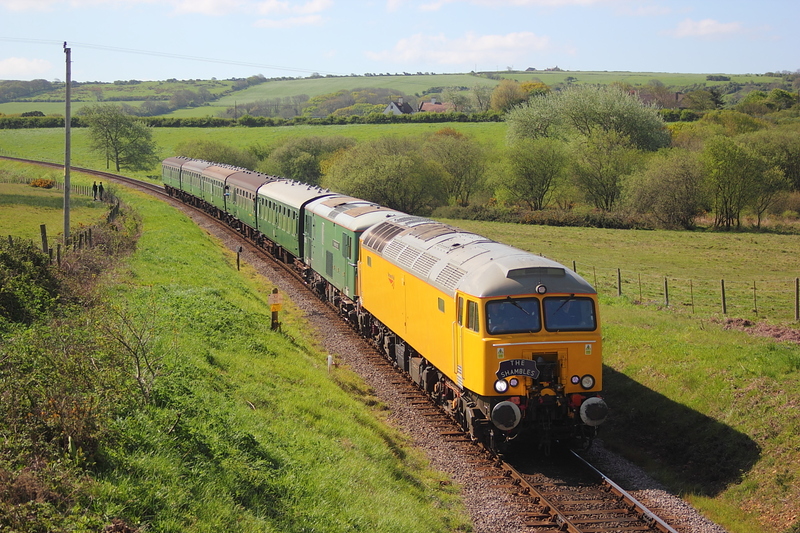 With its" Shambles"headboard in place and token taken from the box,57312+73136"Perseverance" power away from Swanage on 2N16,the 14.30 service to Norden. 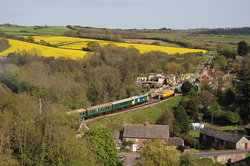 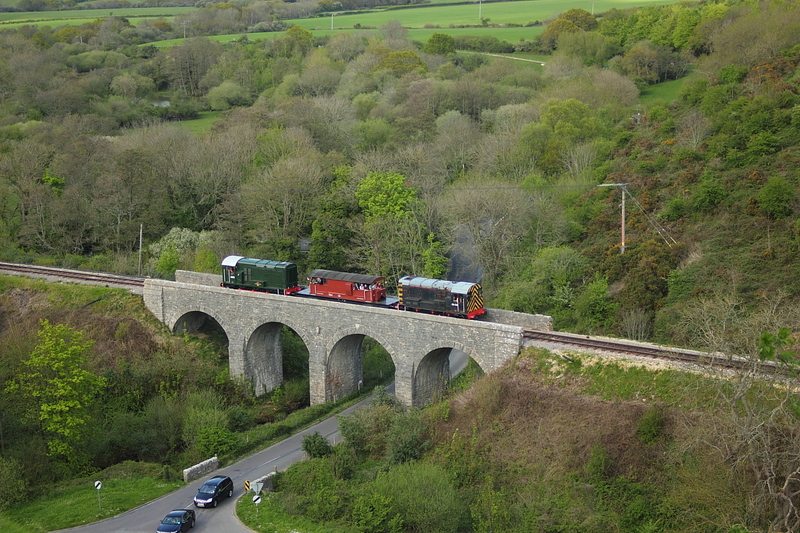 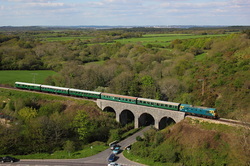 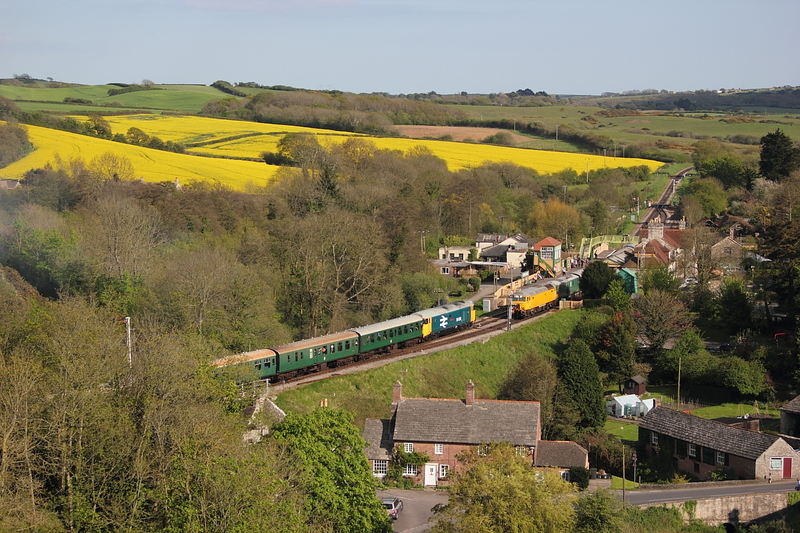 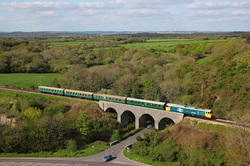 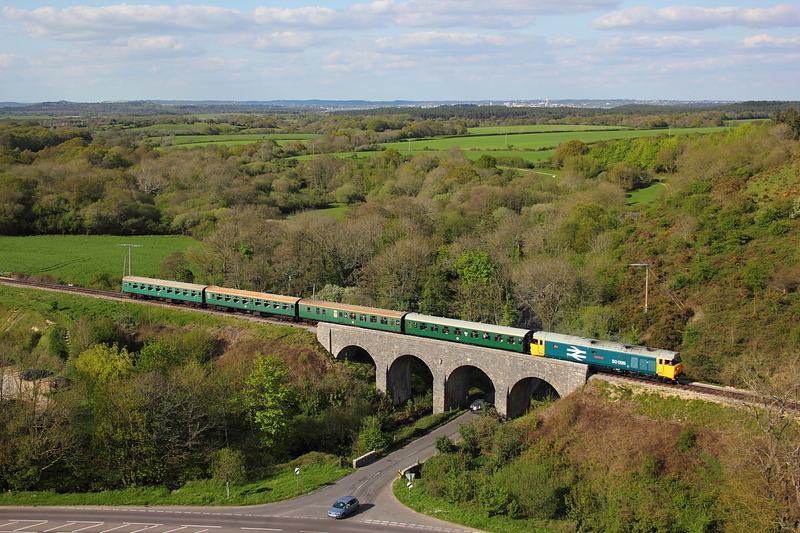 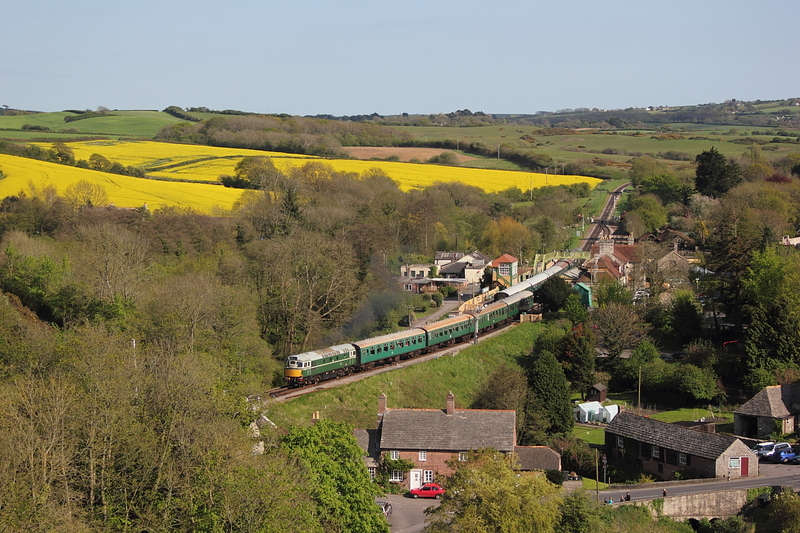 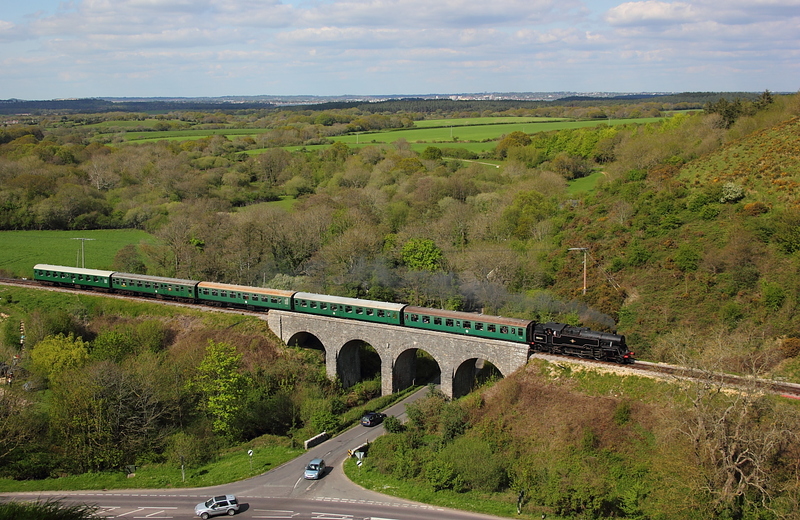 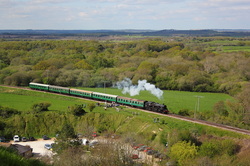 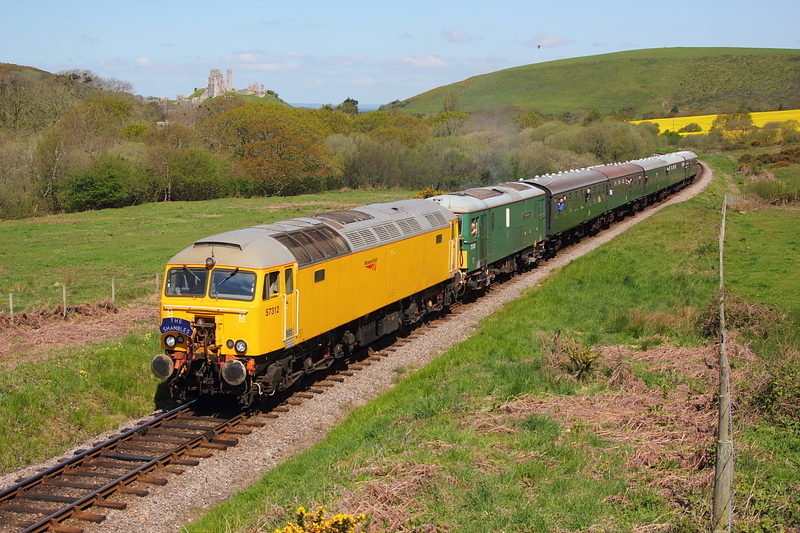 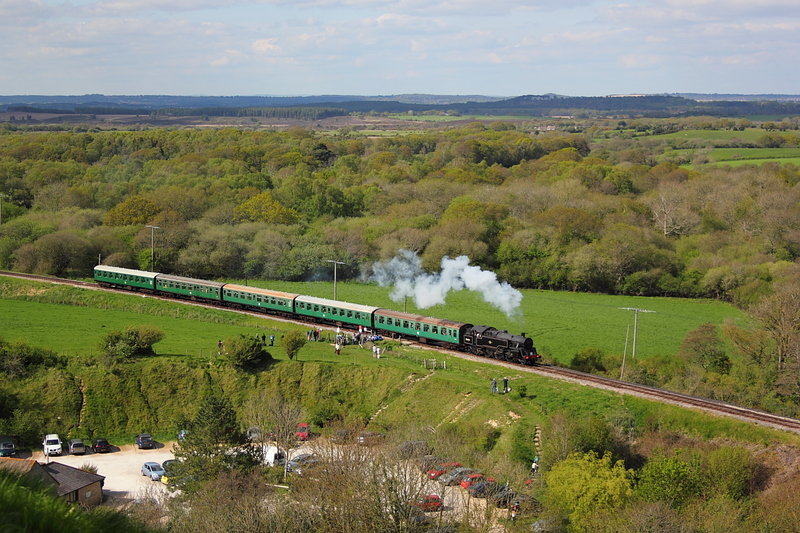 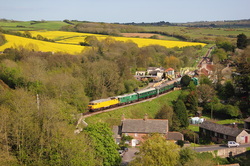 After the ardious climb to the top of the Corfe Castle mound,fantastic veiws can be seen and having just departed Norden at 16.00,4MT passes by on 2S19 heading to the coast at Swanage.Having this vantage point we could see the events prior to this ,ie after the failure of 50026,the 4MT was quickley attached to cover the turn,so was'nt a surprise unlike others down the line, primed up for the fifty. 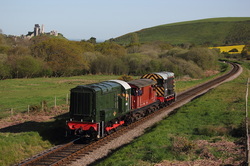 Shunters D3591+08436 pass by the castle on a Norden to Swanage service,with a solitary brake van in the middle. 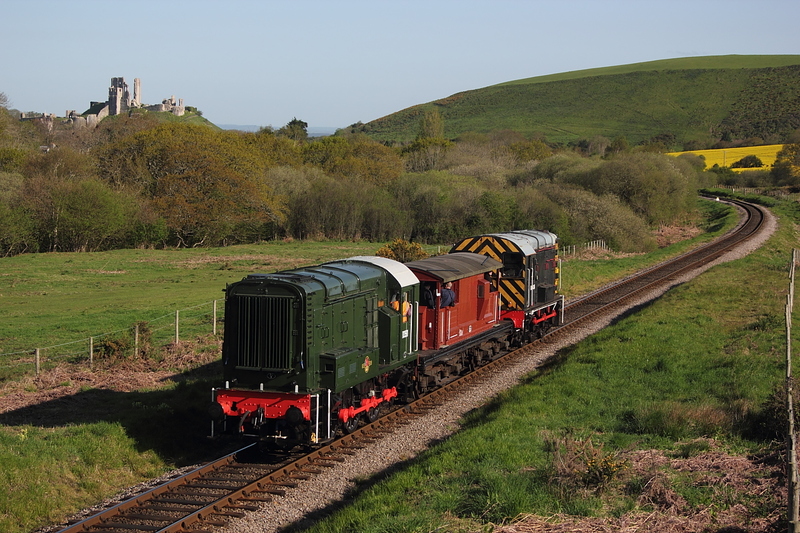 With the days build up of cloud ,showing signs of clearing during the early evening it still needed a very lucky patch of sun to illuminate the veiw from Corfe castle to the station area to record 33111 depart Corfe station on 2N20,the 16.00 service from Swanage to Norden with the pair of shunters just in veiw in the distance passing the common . With a veiw looking across to Poole bay in the distance,a now repaired 50026"Indomitable" passes over the road leading to Studland and the ferry, on 2H11 ,the 17.05 Norden to Swanage service. 57312+73136"Perseverance" sit at Corfe station on the 16.45 Swanage to Norden service,awaiting the passage of 50026"Indomitable" on the 17.05 Norden to Swanage service,before commencing on its last leg of its journey to Norden. 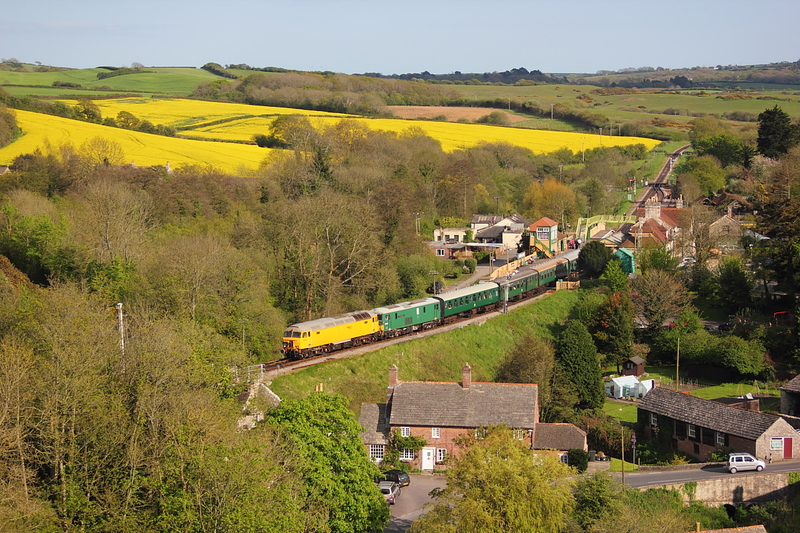 Network Rail yellow 57312 adds to the colourfull scenery afforded from the vantage point on the Corfe Casle mound,and with ED 73136"Perseverance" in tow for braking purposes,departs the booked stop at Corfe station on 2N22 ,the 16.45 Swanage to Norden service. Proving to be my last photable service of the day,D5401 approaches the Norden destination on 2N26,the 18.10 from Swanage.